Yesterday I suggested we must beware of legalistic moralizing when preaching the Proverbs. Tomorrow I’ll offer two simple approaches to full-length sermons on single proverbs. Today I want to share two more “foundational thoughts” that I think should be kept in mind. Thought 2 – We should preach Christ, but let’s not be overly speculative and force Christ into every line. I won’t delve into the issues, good and bad, with preaching Christ as “lady wisdom personified” in this post. It is possible to preach Christ from Proverbs, but it isn’t a game where the most creative link wins a prize. Some of what is done with good intentions does come across as Christian gymnastics and even the most informed listener struggles to see how anyone else would have come to that conclusion from that text. Let’s be careful not to lose biblical credibility while trying to “preach Christian.” Better to preach Christ in light of the larger flow of biblical revelation than to make a hop, skip and jump from a rock badger to the Rock of Ages. 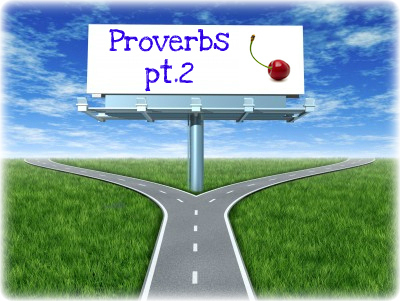 Thought 3 – Proverbs gives us a compelling framing imagery of the two women. Proverbs is a literary piece of art. Now we do lose so much in terms of the assonance, alliteration, word play, etc. – kind of like translating “a stitch in time saves nine” into Italian, or “raining cats and dogs” into Korean. And we are not really attuned to Hebraic parallelism when it comes to poetic writing forms. But we shouldn’t miss how the collection of short, memorable and pithy sayings is wrapped in a frame of human imagery. Specifically the two personified ladies of wisdom and folly. Which path will the young man take? The road to destruction in response to the heady flirtation of harlot folly, or the wonderful blessing of marriage to lady wisdom? I would be inclined to allow that kind of overt literary framing to provide an overriding narratival snapshot into which the issues of wisdom and folly can be placed in relational terms rather than mere burdens of behavior. So much more could be said on both of these thoughts, so feel free to comment and share your thoughts. ← Preaching Proverbs 1: Epilogues and Exhaustion? Peter, I haven’t written at all on thought #3, and haven’t given it as much thought as I should have. It’s always for me been kind of “it’s there, that’s interesting,” but I’ve never really factored it into my thinking sufficiently. Is Proverbs 5 really about marital fidelity, or is it a poetic way of stressing fidelity to wisdom, or both? Is Proverbs 31 about a virtuous wife, or is it poetically extolling wisdom, or both? Are these passages one meaning, or a surface meaning which is true and applies but also points poetically to a deeper meaning about wisdom? I’m not sure I have a firm answer on that. I put this in a separate comment, as a separate topic and also because it is long. I have rambled on at length about thought #2, finding Christ in Proverbs. I apologise for giving links, but it’s too long to duplicate, and I’ll summarise. 1. It is dubious to see Christ as “the wise son” of Proverbs. 2. It is “unproven” to see Christ as wisdom personified in Prov. 8, and we should be hesitant to preach that which is unproven. 3. It is poor exegesis to see 1 Cor. 1:24 as telling us that Christ is the wisdom which is described in Proverbs. That isn’t the point of that passage. 1. Christ is the supreme example of the wisdom of Proverbs. Thus, rather than say that we see Christ in Proverbs, perhaps we need to turn it around and say we see Proverbs in Christ. Proverbs tells us what wisdom is, Christ shows us Proverbs. 2. As we discussed in the comments on yesterday’s post, Proverbs is a “schoolmaster” to faith in the Saviour. 3. Christ is the ultimate Wise Teacher foreshadowed in Proverbs. The Sermon on the Mount is full of Proverbs. 4. Proverbs teaches that there is a Way of Life — a foreshadowing of Jesus the Way. Hopefully some of this is profitable to stimulate thoughts, and I welcome any feedback, positive or negative.